Apple announced that in the near future you will be able to watch Charlie Brown or ‘Peanuts’ cartoons on their streaming services. Good news for fans of the classics! 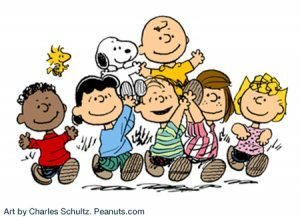 Apple struck a deal with DHX Media to produce original shows, which will include shorts and specials based on Charles Schultz’s classic Peanuts comics and cartoons. It is not clear what Apple will offer, but the arrangement will include Apple-exclusive shorts starring astronaut Snoopy. So that is one thing to expect. It is also safe to say that viewers will see plenty of Charlie Brown and other cast members, too. With this deal, Apple now gets to associate itself with one of the best-known comics in the world. But this is somewhat of a defensive move on Apple’s part. Apple needed to provide more kid-friendly shows across its streaming services right off the bat to compete with Netflix’s Roald Dahl productions or Amazon’s various Prime Video releases. Now, Apple will have the chance to capture a younger audience and long-time Peanuts fans before its planned streaming service even gets off the ground in 2019.